In recent years there have been the addition of new private companies at CCAFS. 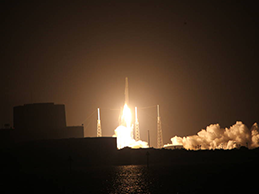 Space Science Services has provided inspection and testing services at CCAFS as part of these programs. Since the late 1960's, pads A and B at the Kennedy Space Center's Launch Complex 39 have serviced as backdrops for America's most significant manned space flight endeavors, - Apollo, Skylab, Apollo-Soyuz, and Space Shuttle. 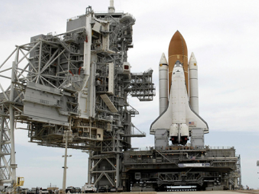 Over the multi-year history of pads A and B, Space Science Services has been involved in the original fabrication, erection, and numerous modification projects at these launch complexes. These services were to help our customers reach their quality objectives. This eastern processing facility supports current known and future planned spacecraft processing and encapsulation of yet unknown satellites and payloads. The layout of the compound allows three (3) programs to operate in the facility, fully independent of each other. Space Science Services was involved throughout the construction phases providing inspection and testing services. The giant crawler transporter carried the Apollo missions and Space Shuttle to the launch pad. Space Science Services has been involved in numerous modifications and upgrade projects to the crawler. Most recent is the current upgrades for the Space Launch System (SLS) Rockets. The mobile launch tower is a 350-foot tall, 9,000,000-pound structure that will support the next generation constellation spacecraft from assembly to lift off. 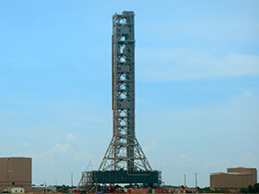 Space Science Services provided quality control inspection and nondestructive testing services throughout the fabrication and erection of the launch tower.